In the spring of 1935, more than ten years after the first staking in the Fournière District, the first buildings were constructed. In 1937, nearly 400 men worked in the mines of the area, which included: Canadian Malartic, Sladen, and East Malartic Mines. The need to establish a proper city was at hand and government quickly mobilized resources to manage its construction and Malartic was founded. 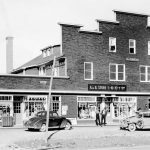 Soon, the city began to see its first shops: hotels, pharmacies, restaurants, grocery stores and banks – all of which improved the quality of life for workers in the region. Professionals also established themselves in Malartic. By December 1938, there were five doctors, a dentist, two lawyers and a notary. In just a few months, about thirty commercial buildings and new streets were built, which gave rise to small residential neighbourhoods. 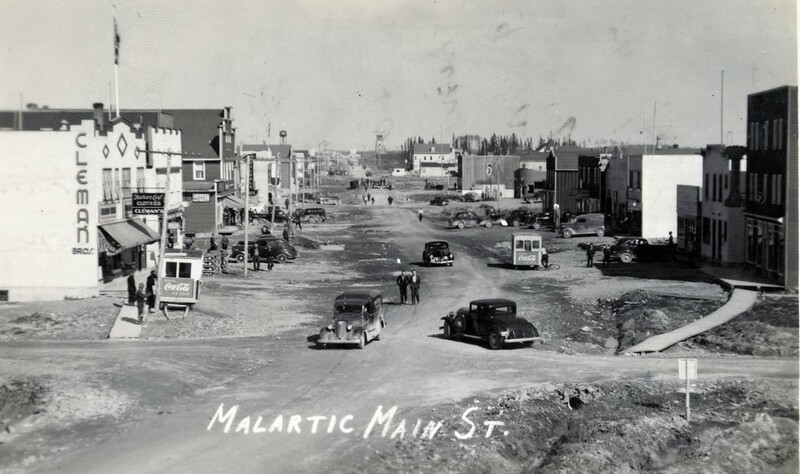 Malartic main street in the 1940s. 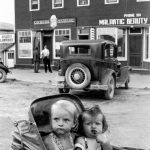 In March 1939, Canadian Malartic Gold Mine Ltd and several citizens felt it was time to develop the city in a more formal manner. Supported by Mr. Emile Lesage, MP for Abitibi, a bill was presented to incorporate Malartic. Finally, on April 28, 1939, Malartic received its incorporation. The first meeting of the City Council took place on June 6, 1939. The council was headed by Mr. William B. Hetherington, first Mayor of Malartic. In the spring of 1940, the road linking Montreal to Mont-Laurier was opened, making the journey from Malartic to Montréal in 12 hours a reality. Two children in a stroller in front of the Shannon building in the 1940s. Dionne building located in Malartic in the 1940s. The population of Malartic at the time is roughly 2200 inhabitants, 400 of whom are property owners.